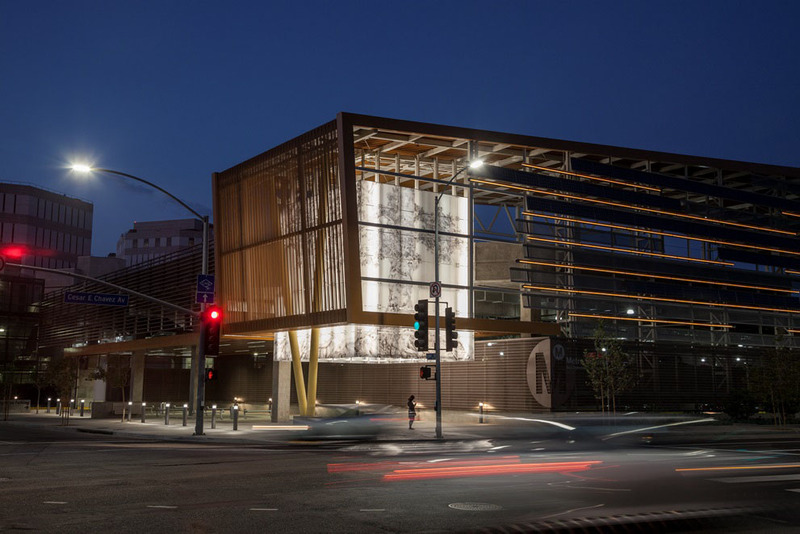 Christine Ulke’s artwork for the exterior of the Division 13 Bus Maintenance and Operations Facility in downtown Los Angeles commemorates an iconic sycamore tree that stood for approximately 400 years three blocks south of the building site. Located near the western bank of the Los Angeles River, the massive tree was at the center of Yaanga, one of the largest settlements of the native Tongva people in the LA basin. In the late 18th century during the Spanish founding of the nearby El Pueblo de la Reina de Los Angeles, the sycamore was mistaken for an alder and acquired the Castilian moniker “El Aliso,” for which it is known today. When it was cut down in 1895 due to encroaching industrialization, it was approximately 60 feet tall with branches extending over 200 feet outwards. Commanding a prominent location at the southwest corner of the Division 13 facility, Ulke’s artwork honors this history. 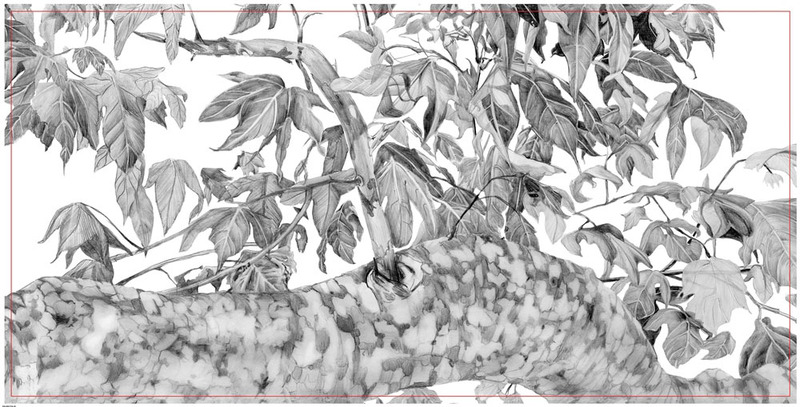 A series of highly detailed graphite pencil renderings of a sycamore drawn from historical photographs and local living specimens were created by the artist and translated into a grid work of translucent resin panels affixed to a metal framework. Illuminated from within by LED lighting, the overall effect will emulate an urban-scale lantern. Visible in soft grays during the day, the luminous artwork will be a beacon at night and a stunning reminder of Los Angeles’s vestigial roots. Construction of the facility, located at the corner of Cesar E. Chavez Avenue and Vignes Street and directly across from the Metro Headquarters Building at Union Station, is scheduled for completion in June 2015. Visit metro.net/projects for further details. "This artwork is dedicated to the sycamore tree that stood in the center of the settlement later known as Los Angeles. I imagine the outer ring of its root system reaching up to the artwork’s site. One of the biggest sycamores in the riparian forest, El Aliso was a meeting place for the native people. Until today, the culture of meeting under the canopy of sycamore trees remains. 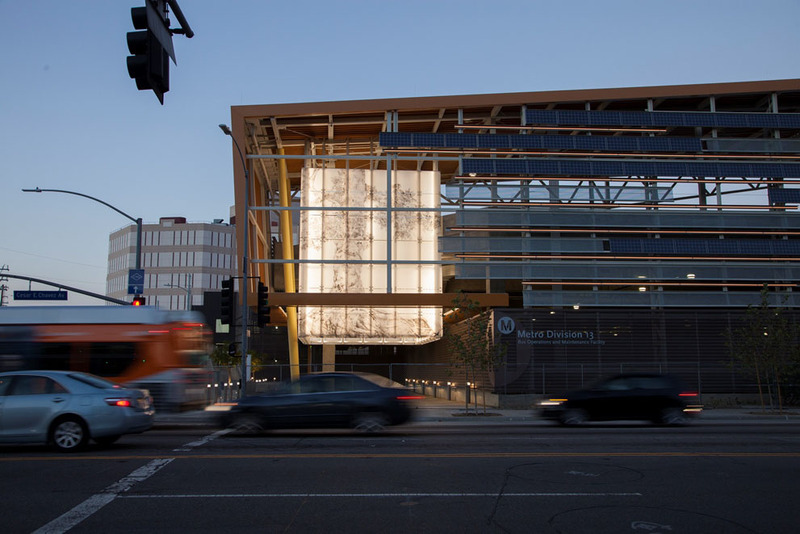 Raised from the ground, the lantern-like work has a floating appearance, ever reminding us of the roots of Los Angeles." CHRISTINE ULKE (b. Germany) is an artist and scientist. She holds master’s degrees from the California Institute of the Arts and the Hochschule der Künste, Berlin, and a doctoral degree from the University of Leipzig. Ulke has lectured throughout the United States and taught at universities in California and throughout Germany. Among her public artworks are permanent commissions for the cities of Los Angeles, Pasadena and West Hollywood, as well as temporary installations in Berlin, Hamburg, London, Mexico City, New York City and San Francisco. She currently works as a research scientist at the German Depression Foundation.